I was asked to write an article for a Canadian Treasure Hunting Magazine on metal detecting in Cape Town. Cape Town is the second-most populous city in South Africa with an estimated population of 3.5 million. The city is famous for its harbour, as well as its natural setting in the Cape floral kingdom, including such well-known landmarks as Table Mountain and Cape Point. It is hailed as one of the most beautiful cities in the world as officially recognized by Forbes. National Geographic has also listed Cape Town as one of the most iconic cities on the planet and "Places of a Lifetime". Picture of Table Mountain taken from Blue Berg Beach across Table Bay. Located on the shore of Table Bay, Cape Town was originally developed by the Dutch East India Company as a supply station for Dutch ships sailing to India and the Far East. Jan van Riebeeck’s arrival on 6 April 1652 established the first permanent European settlement in South Africa. Cape Town quickly outgrew its original purpose as the first European outpost at the Castle of Good Hope, becoming the economic and cultural hub of the old Cape Colony. Today it is one of the most multiracial cities in the world, reflecting its role as a major destination for immigrants and expatriates to South Africa. It would therefore come as a surprise to Canadian readers to learn that we are not that many detectorists in Cape Town as the hobby is not yet well established with only about 20 or so dedicated hobbyists out of a total population of 3.5 million. When I started detecting in 1997, there were only about ten Capetonian detectorists, but over the past decade we steadily grew in numbers – thanks maybe to the many internet MD-forums that sprang up on the Internet that was eagerly followed by some local treasure hunters that saw what was possible on especially North American beaches. Clifton Beach – a very popular Cape Town Beach – but extremely expensive in real estate terms. A local friend of mine, Wolfgang Roux, was at that stage the local agent for a well known metal detecting company that had quite capable beach detecting machines available. Most of us that dabbled with detecting before but had poor machines, now suddenly had quite professional machines available, and as they say, the rest is history. As Cape Town is situated on the southern tip of Africa, it is one of the few places on earth where two major sea currents meet - the cold Benguela current sweeps up from the Antarctic along the Atlantic coast. The east coast has the north-to-south Mozambique/ Agulhas current to thank for its warm waters. So the western beaches of Cape Town has very cold water (lots of sun tanners but very few bathers) while the eastern beaches have warmer water (both tanners and swimmers). On the Western side, the well known beaches are Blue Berg Strand (see pictures), Milnerton, Sea Point and Clifton (to name but a few); while on the eastern side there are Muizenberg, Macassar, Somerset-Strand and Gordon’s Bay. All of these beaches have produced plenty of coins and jewellery over the years. I used to keep track of all my finds when I started detecting in 1997. After finding 25 000 coins in a few short years I lost interest in the bookkeeping exercise. However, I remember that I averaged about 40 gold rings and about 100 silver rings a year. I mostly detect on the wet sand and seldom ventures into the water. A friend of mine, Andy Naude however, almost exclusively SCUBA detects in the many tidal beach pools situated on some of the rocky beaches around Cape Town. Andy showed me that if it was jewellery one were after, and especially gold jewellery, then one must venture into – and down under – the water. For every gold ring I found on the beach, Andy found about 4 or 5 under the water. I did a SCUBA course in 2000 and started detecting with Andy under water, but never really took to it – to be honest, I enjoy walking on the beaches more. We have had many welcome overseas detectorists visiting here in Cape Town who detected with us over the years – there were Gerry Freeman–Smith from England, Jim Cianelli from Brooklyn, New York, Francois Constanty from France and Tom Burnes from Iowa, USA and many others. And they all commented on our wonderful beaches and sunny weather. However, when it comes to beach detecting it is no secret that the best time to detect is NOT the sunny time of the year when the beaches are frequented by thousands of beachgoers. Actually, the most productive period to detect is the winter – the stormy season when the beaches are pounded by the winds and waves and the goodies exposed by the top layers of sand being swept off and taken away by the retracting tides. I can remember so many cold Saturday mornings braving the wind and rain on the local beaches but with great returns - 2 to 3 gold rings per person per morning on a stormy winters day is certainly not unheard of. Picture taken during winter with Table Mountain in the background – see the difference compared to the first picture taken at the same beach – Blue Berg Strand. Yes, Cape Town has two names – the one positive – The Cape of Good Hope: the other one not that welcoming as Portuguese navigators in the 16th century called it the Cape of Storms. But for us local beach detectorists both names bode well – the Cape of Good Hope is wonderful to detect in summer as one can at least eye the golden beaches and bronze bodies – and the Cape of Storms gives us the chance to expose plenty of gold rings and other welcome finds that the winter weather produces. If you ever wonder over to the Dark Continent, and especially down to its southernmost city Cape Town, come say hi and I will show you the golden beaches laden with its golden treasures. PS: The last picture is of the front page of our local metal detecting newsletter, Treasure Talk (of which I was the editor at that stage) showing a group of us with a welcome visitor from Iowa in the USA – Tom Burnes. Many gold rings were found that day and our American friend could not stop smiling! Very interesting read. At bob we are always looking for great content and would feature articles like this on our blog if you are interested. I have no problem with that - not sure how a blog works, but if you can post it there, it is fine with me. I must say, I enjoyed it too. Where would one acquire one of these detectors? I will ask Wolfgang to list his detectors on Bid-or-Buy - however, I am not sure under which category - maybe coins or jewellery? He is also not very computor literate, so maybe BoB has someone who he can contact how to sell these machines on BoB? Very Interesting Pierre, i am also trying to promote the Hobby amongst some locals here on the forum and it could turn out to be a nice family hobby and social event. Guys, Pierre and Mac, is it possible I can somehow link this to the other forum (Mac you should be able to answer this one), but with your permission Pierre unless you come over and talk about this instead? Please do NOT link this article to any other international or local forums at this stage. This is a draft I wrote for a Canadian magazine, and it this is leaked to other forums, the proverbial cat will be let out of the bag and second hand news to whomever. At this stage - let’s keep it a Bid-or-Buy forum posting only. Kind regards and I really admire your enthusiasm. no problem at all. Maybe one day you can talk a walk over to my side and tell us some stories to wet the other peoples appetite but in the meantime I will do my best to try and get more people interested. With regards selling metal detectors online I think that is an excellent idea as there are a few BoBbers interested so see what you can organise maybe. Pierre, when you say 20 or so dedicated hobbyist I assume there are allot more that are weekend hunters? In the states the guys go out during lunch hour and go hunting in parks and sports fields etc and sometimes come back after 45 min with a couple of items. Yeah, moved down about a year back. we need to organise a beach walk then here on the Milnerton side. I have an aquaintance who does searches for people, when they lose rings etc he goes and finds them. oh really this is the first time i hear this very interesting. with your permission, I will chat to our marketing guys on Monday and once you have published your article we can also feature it on our bob-blog at bidorbuy Official Blog and our category managers will then assist you with finding the right category to list the items. Lovely article Pierre-Henri! Most descriptive - and tantalising. Just bought a second-hand MD - hoping the rain stops tomorrow so it can be taken for a test run! Yippeee! congrats MsPlod now go out in the rain then are sure no one is about and you can do your thing. It has been pouring all night here but we may still take a beach walk just now. My first coin ever with my Metal Detector. 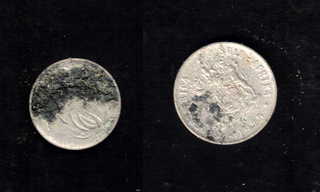 A 10c piece dated 1975. It might not be the find of the decade but it is a start.